Jason Dorgan holds the record, 22d6h, set April 2007. The Ice Age National Scenic Trail winds for over 1000 miles though rural Wisconsin, from St. Croix to Potowatomi Park at Sturgeon Bay. The Ice Age Park & Trail Foundation (IAPTF) "protects, promotes, builds and maintains the Ice Age Trail", in cooperation with the Wisconsin Deptartment of Natural Resources, the National Park Service, and local governments and private landowners. In mid-April 2007, 42-year-old mechanical engineer Jason Dorgan traded in his CAD drawings for an 8-pound black Camelbak, which he carted for 11 hours a day for three weeks while running Wisconsin’s Ice Age Trail, completing the 1079-mile journey in 22 days 6 hours. The Ice Age Park and Trail Foundation (IAPTF) documents thru-hikes on the trail, recognizing anyone who reports completing the entire span-including its interconnecting road segments-with the official “Thousand-Miler” designation. Only a handful of hikers are recorded as having covered the full distance to date. Commencing at the Ice Age trailhead in St. Croix Falls, Wisconsin, Dorgan averaged nearly 48 miles a day, ending in Potowatomi Park, at Sturgeon Bay, Wisconsin. Upon completing his passage on May 6, the Madison-based ultrarunner was greeted by a troupe of friends and family toting celebratory champagne and brownies. Dorgan ran in high style, resting in hotels each night and meeting up with support-crew members Tom Bolt and Robert Wehner several times daily to refuel with pizza, hamburgers, jelly beans, gels, peanut butter and honey sandwiches, and Ensure-to the tune of 6000 calories a day. Dorgan’s crew also heated up chicken noodle soup on the support vehicle’s engine block. Friends and fellow runners often accompanied the lanky runner for long segments of his run, occasionally bringing him milkshakes and other treats. He posted regular reports on his blog, which the Milwaukee Sentinel Journal, Madison Capitol Times and other regional papers occasionally picked up. That is cool, I spent time on parts of what is now that trail as a kid in the 1990's in some of the state parks Devils Lake and the Madison area. Late kudos to Jason for his record and raising awareness and funds for the trail! Such a long trail obviously passes through numerous Wisconsin counties, which is a pretty cool way to link the geology, history, and culture of the state. The Waukesha Co section is supposedly just shy of 45 miles, including connecting road sections. The "Walk the Wauk" program encourages section-hiking of Waukesha Co trail sections. I'm visiting from out of town, and have a day, so I'll give it a go unsupported. Plan is 4:30-4:45AMish tomorrow morning (28 July 2016) being dropped off at Emma Carlin section (slightly before the Wauk Co line, but a natural spot to start), and running east/north to County Line Rd near Monches, WI. Hope to aim for 9ish-10 hours. I'm most apprehensive about connecting road sections/getting lost but we'll see how it goes. I'd love to hear of other times if anyone has done it. My time won't be as fast as a similar caliber runner with local familiarity and a better time of year (e.g. Autumn), let alone a really fast runner, but this might spur some ideas. Anyway, I ran the Waukesha County section (~45M) of the Ice Age Trail in a soft/modest 10:10 total time on 28 July 2016 (from 5:02am to 3:12pm). Time is from Emma Carlin TH road crossing to CTH Q past Monches section. It's a worthwhile endeavor for somebody local who needs a long run: it would be easy to do this in 8 hours for a fast, prepared runner in good conditions; and a very fast runner in under 6. I grew up in Waukesha Co, so it was a rewarding tour. - Avoidable Mistakes: I took some pictures, then backtracked to find my dropped camera (25 minutes). I took a spur to a campsite to search for bugspray (see below) that added another 7-10 minutes. I missed a few minor wrong turns for another ~10 minutes. Spent a few more minutes chatting with my cousin(!) I randomly saw on a bike path! - BUGS: The deer flies were horrendous! Swarms would follow and circle around my head, and I could rake my hand through my hair every 10-20 seconds and get dead bugs to fall out. This was going on for over an hour in the denser woods, I didn't bring bugspray and it would have been utterly intolerable. I gambled and took a spur trail to a campsite shelter. As I hoped, there was a can of spray out on a picnic table. I used a bit for my hair and it made all the difference in the world, so thanks! This should be a huge consideration, especially in summer. I would have considered a hat/bandana. - I saw more people playing Pokemon Go (near parks/bike paths) than I did hiking anywhere on the trail! (Only people I saw on the trail were Lapham Pk section). - I had the printed instructions from the "Walk the Wauk" program, but instead used my wife's smartphone and downloaded the "Mammoth Tracks" app. I paid $9.99 for the eastern section maps. This was the first phone app I've purchased and the first time I had GPS on a run, ever, and it was worth it. I downloaded the map for offline usage before leaving and put the (Android) phone in airplane mode to save battery, and it worked perfectly. I used the map occasionally for the first few hours but eventually discovered that the "Waypoints" tab could tell you your mileage number and the number of miles to the next waypoint (as well as the finishing point). - I missed an easy turn early just before RR tracks, when I followed an orange arrow and more prominent logging trail (due to logging!) to the right, rather than across the tracks on a sharper left where the blaze is quickly visible (after you commit to the correct turn). Another one was a sharp left off of a bike trail to go around the golf course, not long after crossing Hwy 83 at a stop light (the first major controlled intersection, IIRC). - Delafield is a great place to restock liquids: there's a Mobil gas station nary a block off the trail as you go through downtown. - I liked going W-E, starting with a dropoff at Emma Carlin. Going this direction also leaves you the option of ending at the Ox and Cat Sports Bar and puts faster road miles toward the end. This would be a really great, doable, and impressive self-supported long-day loop if you dropped a bike off at the end. My favorite parts going W-E were the first sections (other than bugs), into and through Scuppernong, as it was the most woodsy. Although it also had more shuffling lawn-carpet as well. Lapham Peak is always good -- climb the tower of course. But past it, at least in July, were exquisite fields of wildflowers, about the best I've ever seen in WI. And then, the last 3 miles through Monches were great: all runnable trail. And ironically, when you have just about a mile left, perhaps the most beautiful part of the trail is the bridge across the bubbling Oconomowoc River. Hope this gets somebody else there! The IAT is a gem and more people (especially local) need to get out on it. Cheers! Beautiful time of the year here in S.E. Wisconsin as I am sure it is elsewhere. Really love reading through all of the attempts and success stories of various FKT attempts/efforts, all of which are inspiring in their own right. The Ice Age Trail really is phenomenal, huge congrats to Jason and Mike for getting out to enjoy it and getting others excited and motivated to do the same. Mike I do agree, living in the greater Milwaukee area, I think it would be great to generate some additional attempts of the IAT sections in both the Southern and Northern units of Kettle Moraine State Forest and make a “Recognized Route” for both segments. It really is a fantastic trail to run on with some nice climbs and descents with its fair share of rocky / rooty terrain. The distances for both put it in perfect range for some un-supported runs. For these reasons (among many others) I will attempt run the IAT segment that falls within the Kettle Moraine State Forest Southern Unit, starting just south of Whitewater Campground at Clover Valley Rd and finishing at Lapham Peak. 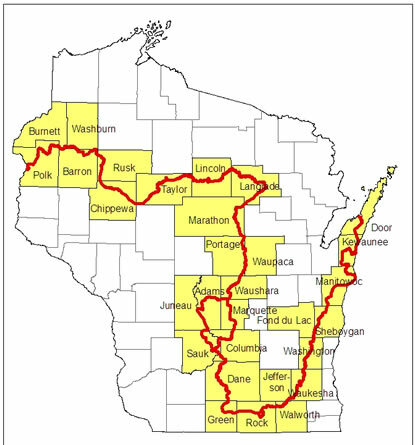 The WI DNR site pegs the distance to be 42.7 miles. I’ll be carrying all food and water for an Un-Supported effort. Exact date / time is floating at the moment but it should take place in the next few weeks, may need to be a spur of the moment trip. I will post results when complete. Ultimately - I’d like to link the two starting from South to North or vice versa connecting the segments by riding my bike along the Glacial Drumlin Trail to the Oak Leaf Trail then head North on the Ozaukee Interurban Trail - approximately 70 miles of easier road / bike path riding. I feel this would be an extremely fun little adventure passing through a few nice villages along the way for re-supply. Sounds cool, Cedar Wing! Looks like a great distance and amount of trail. The Walworth/Jefferson Co trail section right next to that looks to be an even marathon distance, another good option that people should do. Your option of the KM Southern Unit really seems like it gets a lot of trail bang for the buck, more of a natural combination than county-line borders. I really like your bike self/un-supported idea and would love to see that come to fruition. Any hunting-season awareness to be mindful about? Good luck and enjoy! Kettle Moraine North mileage from CH-H to CH-P is almost identical, I hope to post a time on this section in the near future.